It only took four days after U.K. voters chose to leave the European Union for a liberal climate scientist and eco-activist to blame the whole event on — you guessed it — global warming. 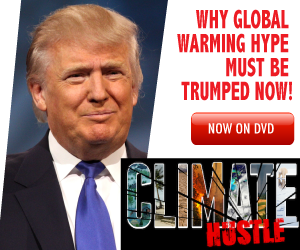 Joe Romm, a climate scientist and writer for the liberal blog ThinkProgress, wrote an article Monday arguing the so-called “Brexit” and the rise of GOP candidate Donald Trump are driven by global warming. The Syrian migrant crisis “had an outsized impact on the Brexit,” as NBC News political director Chuck Todd said Friday. You can see that in the pro-Brexit poster from the U.K. Independence Party (above) — which became a major advertising campaign of the referendum — featuring thousands of male refugees streaming from Croatia into Slovenia last October. Environmentalists and some scientists have tried to link the Syrian civil war to man-made global warming for years. The argument has been repeated by Democratic presidential candidates and even Secretary of State John Kerry as evidence for why the world needs to get serious about a warming climate. “It is not a coincidence that immediately prior to the civil war in Syria, the country experienced the worst drought on record,” Kerry said in 2015. Romm took the argument one step further, and is now using it to claim Brexit was a consequence of a global warming-fueled refugee crisis.